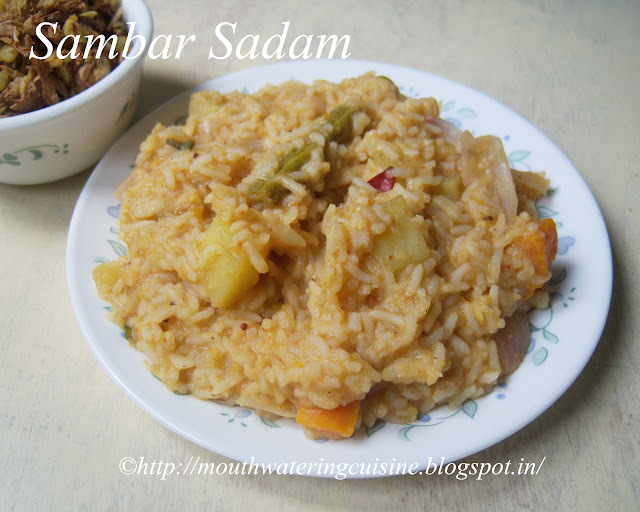 Sambar sadam or sambara rice is a one pot meal from South India. I have learned it from my aunt. 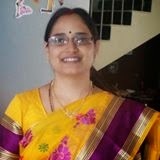 She makes it regularly and whenever she makes sambar and rice separately and if the rice has to carry forward, for the next meal she converts it into sambar sadam or rice. We like that too very much. Heat oil in a kadai, Add chana dal, coriander seeds, red chillies and dry coconut. Fry them till they turn into light brown color. Keep them aside. Once they are cool, grind them to a coarse powder and keep it aside. Soak tamarind in enough water for half an hour. Squeeze out the pulp and take tamarind juice and keep it aside. Cut all the vegetables into cubes. Pressure cook them for three whistles. Cut onions length wise. Keep them aside. Do not pressure cook them. Add 2 cups of water to rice and 1 cup of water to dal. Pressure cook them in separate vessels for three whistles. Heat oil in thick bottomed vessel. Add mustard seeds and cumin seeds. Once they start spluttering, add onions and saute for a minute. Add tamarind juice, salt and turmeric powder. Mix well. Add pressure cooked vegetables and sambar powder. Bring it to boil. Add cooked dal and rice also. Allow it to boil for two minutes. The consistency of rice should be slightly loose only. It tends to get thick once cooled. 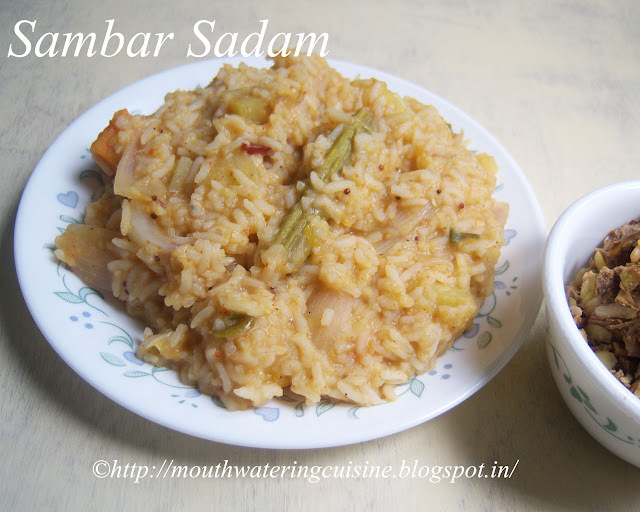 Serve hot sambar sadam with papad and potato chips.